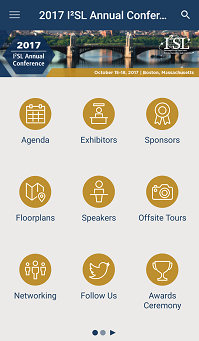 The 2017 I2SL Annual Conference features an onsite mobile application (app) to connect attendees, speakers, exhibitors, and sponsors. All conference offerings and details will be available in the app. I2SL will save more than 12,000 sheets of paper by not printing an onsite conference program! Attendees with iOS and Android devices are able to access the content of the app without using an Internet connection or data. BlackBerry and Windows phone users will be able to use the web version, which does require Internet/data. A limited number of printed conference agendas will be available onsite for attendees without a smart phone. Learn more about using the conference app. I2SL recommended downloading the app before leaving for the conference.